Series of interconnected cracks caused by fatigue failure of the HMA surface (or stabilized base) under repeated traffic loading. 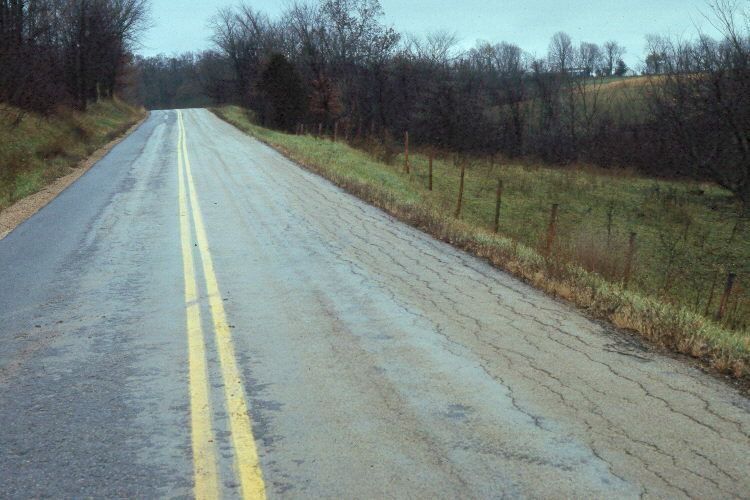 In thin pavements, cracking initiates at the bottom of the HMA layer where the tensile stress is the highest then propagates to the surface as one or more longitudinal cracks. This is commonly referred to as “bottom-up” or “classical” fatigue cracking. 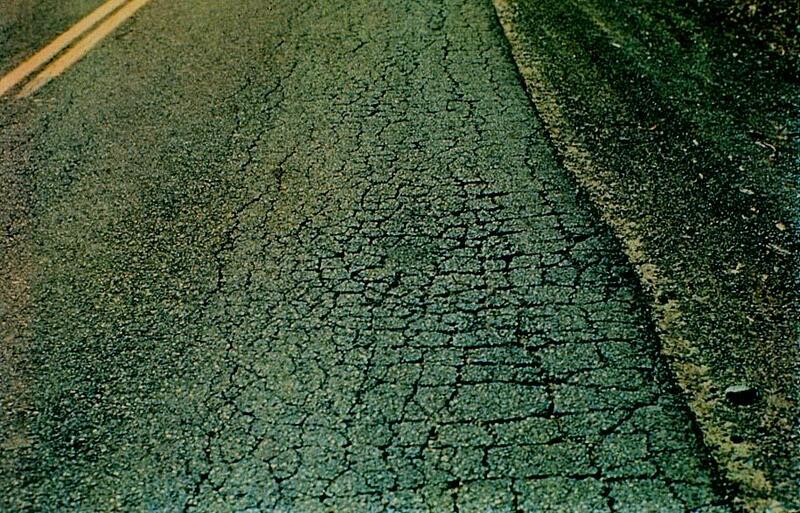 In thick pavements, the cracks most likely initiate from the top in areas of high localized tensile stresses resulting from tire-pavement interaction and asphalt binder aging (top-down cracking). After repeated loading, the longitudinal cracks connect forming many-sided sharp-angled pieces that develop into a pattern resembling the back of an alligator or crocodile. 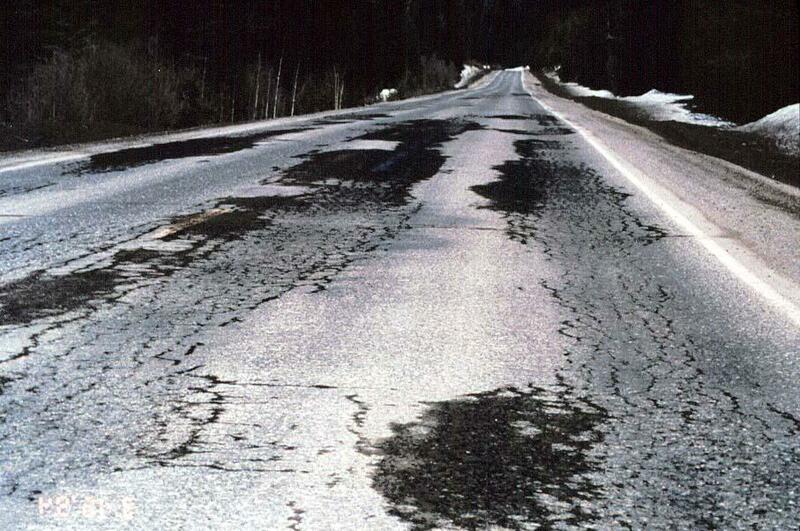 Indicator of structural failure, cracks allow moisture infiltration, roughness, may further deteriorate to a pothole. Loss of base, subbase or subgrade support (e.g., poor drainage or spring thaw resulting in a less stiff base). Small, localized fatigue cracking indicative of a loss of subgrade support. Remove the cracked pavement area then dig out and replace the area of poor subgrade and improve the drainage of that area if necessary. Patch over the repaired subgrade. Large fatigue cracked areas indicative of general structural failure. Place an HMA overlay over the entire pavement surface. This overlay must be strong enough structurally to carry the anticipated loading because the underlying fatigue cracked pavement most likely contributes little or no strength (Roberts et. al., 1996).